The Connecticut Valley Railroad once carried both passengers and freight along the west bank of the Connecticut River between Hartford and Old Saybrook. Completed in 1871, today the railroad is known throughout New England for the nostalgic steam-powered excursion trains that run on a portion of the line between Essex and Chester. Until now the history of this popular tourist attraction has been the stuff of local lore and legend. 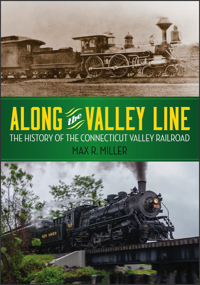 This book, written by railroad historian and former vice president and director of Valley Railroad, Max R. Miller, provides the first comprehensive history of the Connecticut Valley Railroad through maps, ephemera, and archival photographs of the trains, bridges, and scenery surrounding the line. Offering tales of train wrecks, ghost sightings, booms and busts, Along the Valley Line will be treasured by railroad enthusiasts and historians alike.